The Bio-Rad CFX96 Real Time PCR System offers you flexible and precise thermal cycling in one powerful compact package to deliver sensitive, dependable detection. The BioRad CFX96 optical reaction module transforms the C1000 Chassis with LCD Touch Screen thermal cycler into the versatile CFX96 Touch real-time PCR System. This PCR System features six filtered LEDs and six filtered photodiodes, for a 5 color, 1 FRET system, to unite advanced optical technology with exact thermal control. The Bio-Rad CFX96 qPCR System gets you results in under 30 minutes, or for single colors a fast scan option that can return results in as little as 3 seconds. This PCR system also features thermal gradient function that can test 8 temperatures at once and identifies the best annealing temperature in a single experiment. In addition, this gradient PCR maintains exact control, even while ramping by using 6 independently controlled thermal units and a unique, responsive, honeycomb block. The CFX96 Touch Real Time PCR System with C1000 Touch chassis rapidly sets up run and monitors amplification traces in real time on the integrated LCD touch screen. This powerful qPCR control has a large graphical interface and utilizes a protocol autowritter to automatically create the ideal protocol based on your reaction components. With up to five-target multiplexing, the CFX96 can detect up to 5 targets in one well, with optimal light paths centered reproducibly over each well and a dedicated channel for single plex FRET. The unmatched thermal cycler performance, unsurpassed stand-alone functionality, and intuitive software, makes the CFX96 Touch machine an ideal choice to advance your qPCR. The solid-state components, and long-lasting LED’s of this thermal cycler means you’ll get outstanding dependability, and optimal results, with the convenience of scalability. 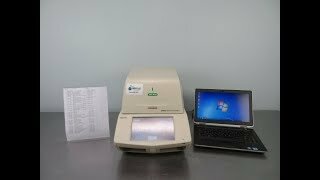 This BioRad CFX96 Real Time PCR has been fully inspected and comes with a current validation and clean bill of health. All of our lab equipment comes backed with our standard warranty. Should you have any questions, please don't hesitate to contact us.